A couple of weeks ago I had a free Saturday afternoon, did not fancy staying home, and was feeling in the mood for a temple .. this used to happen a lot. 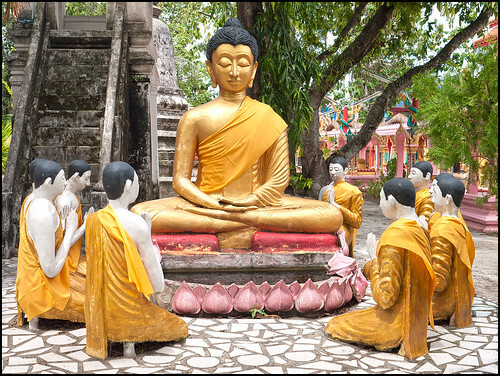 Phuket has many Buddhist temples and also plenty of Chinese shrines and mosques and even a Sikh Gurdwara. 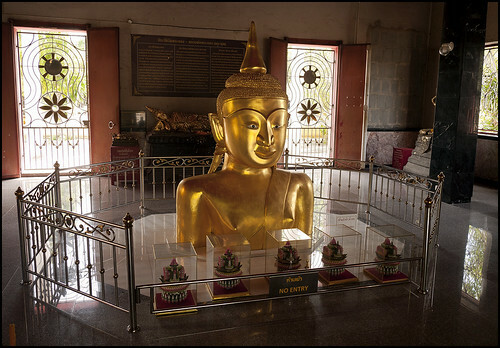 When I started the blog in 2006, I would regularly blog about different temples although (yes I know) most people and readers of this blog don't really care much for temples! So temple-related blog posts are quite rare now. Well, anyway, I had this afternoon free. Daughter was busy with school homework, my wife stayed with her and my boy bravely decided to come with Dad on a temple visiting afternoon :) We headed towards Thalang, in the center of Phuket island, which used to be the main population area before the tin mining boom of the 19th century led to the growth of Phuket Town and Kathu. There are quite a lot of temples around Thalang and I wanted to revisit several to get new photos and update the pages on the blog. We started at Wat Sri Sunthorn which is a little south of Thalang and north of the Heroines Monument. Sri Sunthorn was one of 2 sisters known as the Heroines of Thalang who led the people of Phuket against a Burmese invasion in 1785. The temple used to be hard to spot from the road, but the entrance has been widened recently. There are multiple buildings, but the main attraction is a pretty darn big reclining Buddha which sits on the roof. If you turn west at the traffic lights near Wat Phra Nang Sang you soon reach Wat Thep Kassatri, named after the other of the 2 heroines. 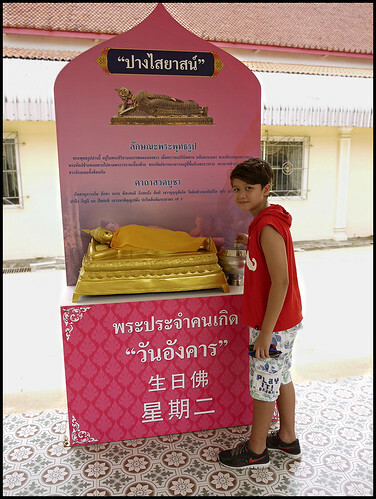 We did not visit on this day and indeed, Wat Thep Kassatri is one temple I have not blogged yet! Instead we headed a little further North and then u-turned back south to find Wat Phra Tong (the road is 4 lane here and the entrance is on the southbound side of the road). Wat Phra Tong's main attraction is a "half Buddha" image which has a mysterious history and each time I have visited there have always been a few people there saying prayers. A nice little afternoon with my boy. Maybe 3 temples was a bit too much for him :) I am told that when I was a young boy, having been dragged around many churches and cathedrals I said "seen one stained glass window, seen them all!" 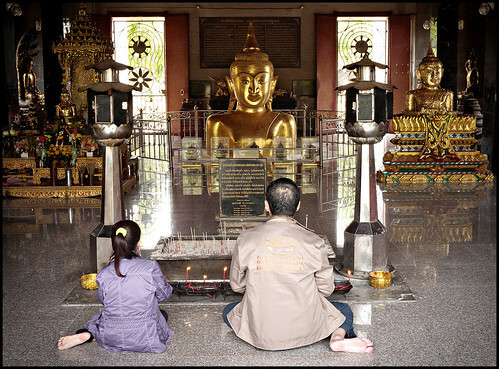 Hopefully a few visitors to Phuket disagree with that and might enjoy a little temple tour. 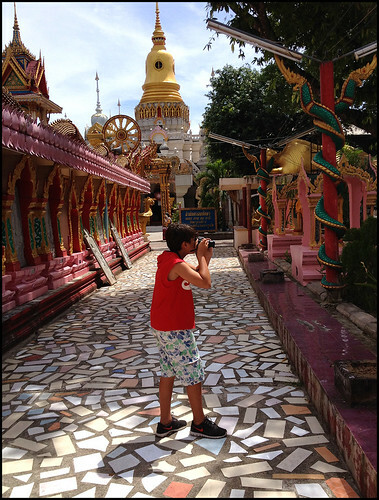 More info on the blog : Phuket Temples.